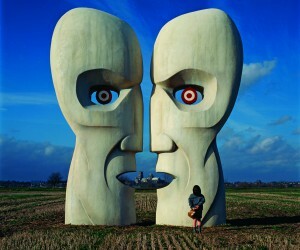 Winchester Mansions is exhibiting Storm Thorgerson’s world-famous LP Cover Art. Thorgerson, who sadly passed away in April, and Winchester Mansions’ former MD, Nils Heckscher had been planning an exhibition for some time to raise funds for charity. Thorgerson was hoping to attend the exhibition, but sadly this was not to be. Thorgerson was the premier rock-album designer of the seventies. His company, Hipgnosis, worked with numerous artists, including Led Zeppelin (“Houses of the Holy,” “Presence”); T. Rex (“Electric Warrior”), and Peter Gabriel (the first three records). Thorgerson became best known for his association with Pink Floyd, and in particular, for the uncharacteristically simple cover he designed for the group’s classic 1973 album The Dark Side of the Moon, featuring the stark image of a prism refracting light against a black background. Once described as a “modern day Dali, Magritte and Man Ray all wrapped into one”, his hypnotic, outlandish, mostly photographic images became as much a part of the mystique of the bands with whom he worked as their music. 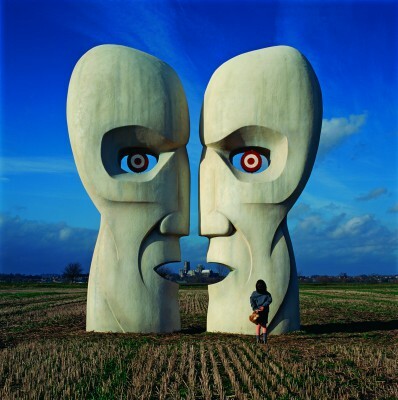 Thorgerson aimed to encapsulate in his art what bands were trying to say in their music. 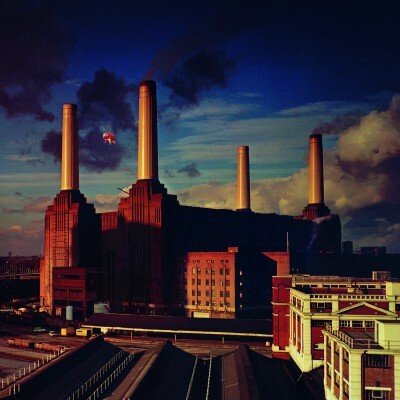 Some of his most outlandish projects included floating a giant inflatable pig over Battersea Power Station to produce the cover for Pink Floyd’s “Animals” (1977), the creepy image of the blonde-haired, naked children climbing the Giant’s Causeway for Led Zeppelin’s “Houses of the Holy” (1973) and more recently, the image of four men playing cards in the desert for Muse’s “Black Holes and Revelations” (2006). Thorgerson insisted on doing almost all his photographic shoots, ignoring the arrival of digital technology. For Pink Floyd’s “A Momentary Lapse of Reason” (1987), he recruited four (4) tractors and thirty (30) helpers to assemble seven hundred (700) heavy iron hospital bedsteads on a Devon beach. It took six hours and when it rained they had to take the beds away again and repeat the process two weeks later. Meanwhile the giant inflatable pig on “Animals” escaped from its moorings, floated 18 000 ft where it nearly gave the jet pilot, who radioed in the sight, a heart attack and was later found terrorising livestock in Kent. In the late 1990s he worked on album covers for bands such as Catherine Wheel, Phish and Ween amongst others. His creativity was not dimmed by the arrival of the CD and his design for P.U.L.S.E, the Pink Floyd live CD, featured a flashing light on its spine. Storm Thorgerson, of Norwegian descent, was born in Potters Bar, Middlesex on 28 February 1944 and educated at Cambridge High School for Boys, where he met Syd Barrett and Roger Waters (two of the founder members of Pink Floyd). After attending Leicester University, he studied for a Master of Arts Degree in Film and Television at the Royal College of Art in London. The exhibition began at Winchester Mansions on Thursday, 12 September 2013 and will showcase a number of Thorgerson’s LP cover art. The exhibition will continue until the pieces are sold. The proceeds will be shared between his family and charity organisation StreetSmart SA, alleviating the plight of street children.